Juicy plum fruit is packed with numerous nutrients that promote health and beauty. It contains vitamin A, vitamin B complex, vitamin C, vitamin K, beta carotene, iron, potassium, calcium, magnesium, etc. It is rich in antioxidants and fights free radicals, thereby working as an anti-aging skin-care agent. 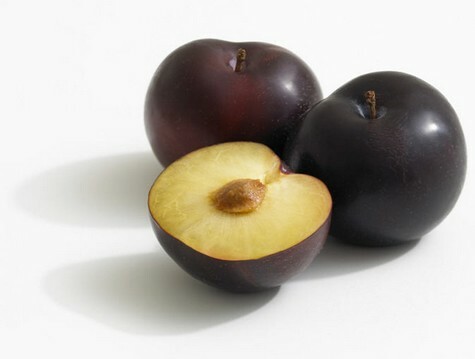 Plums are available in shades of red, blue, green, yellow, amber, purple, and black. You can use plums in any of these colors for making face masks to enhance your beauty at your home itself. • The simplest way to derive the skin benefits of plum is to apply mashed plum mixed with a teaspoon of organic honey. • Mash three plums with the help of a folk and mix a tablespoon of freshly ground coffee, and a teaspoon of organic honey. Apply this fabulous exfoliation recipe to on your face, scrub it, and rinse it off after 10 minutes to remove buildup of dead skin cells, dirt, and grime. • Prepare a face scrub by mixing some granulated sugar and an egg white. Next, cut a plum into two pieces, discard the pit, dip the pieces in the sugar-egg white recipe, and gently rub it onto your face and neck until you use up all the flesh from the fruit. Follow this procedure about once in a week to get rid of blotches and blemishes on skin. • Plum can be applied on all skin types. When using on dry skin, combine a tablespoon of natural plum juice with an egg yolk, and after 15 minutes, wash it off with lukewarm water. When dealing with oily skin, mash two plums, add an egg yolk, a tablespoon of buckwheat flour, half a teaspoon of honey, and apply it on your face and neck for 10-15 minutes. Here’s a video gining tips for buying and storing plums. • In case you have normal skin, then mash three ripe plums, and add one tablespoon each of extra-virgin olive oil and sour cream in it. Leave this facial mask on your skin for 15 minutes and then rinse it off with lukewarm water followed by a plash of cold water. • Boil six plums in water and then allow them to cool. Next, mash these plums and add a teaspoon of sweet almond oil in it. Spread this beauty recipe on your face and wash it off after 10-15 minutes to reduce wrinkles and blemishes. • Blend a few plums to get about four tablespoons of plum pulp. Mix half a tablespoon each of plain yogurt, almond oil, and a quarter teaspoon of turmeric powder in the pulp. Apply this remedy on your face about three days in a week to heal acne, fade age spots, and improve your skin tone. • You can also use plum on to rejuvenate dull, lifeless hair. For this, you need to prepare a mixture of a whisked egg and freshly squeezed plum juice. Massage this recipe on your scalp. Leave it in your hair about 5-10 minutes, and then, rinse it off. Besides, you can include this delicious fruit in your diet to boost the immune system, reduce high blood pressure, relieve constipation, prevent age-related macular degeneration, protect from certain types of cancers and tumors. This fruit is also considered good for individuals suffering from atherosclerosis or diabetic heart disease.